Creative Commons Non-Commercial Attribution Licensed (3.0 US). 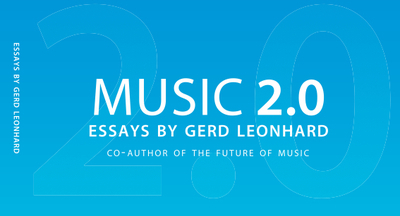 This is a guest post by Gerd Leonhard: Music & Media Futurist, author of “Music2.0“, co-author of “The Future of Music”, CEO of Sonific.com, speaker and advisor. Last week I wrote a response to the now (in)famous Paul McGuinness speech at MIDEM in Cannes. In his otherwise quite misdirected talk, Paul briefly referred to the so-called ‘digital music flat rate’ (Ed. something we’ve been calling a “music tax”) and so I wanted to make sure I specifically address this topic in a separate guest post here at last100. Paul’s MIDEM speech sadly reflects the current situation: a music industry still run by yesterday’s managers, executives and (mis)leaders that are still obsessed with control, more than with anything else. Many of them (with some notable exceptions) still can’t seem to face the fact that despite a long, hard struggle to desperately (re)gain some kind of control over what people do with their music, the industry has in a most spectacular fashion in fact totally lost control over the distribution of its product. And good riddance: this development is neither new nor does it need to be the cause of doom and gloom. Rather, the bizarre part is that the most popular and widespread uses of music are still not blessed with permission i.e. a LICENSE. 10 years after Napster and still no real progress – this amazing ineptitude of the music industry to actually adapt has now led to a ‘music is free, period’ attitude among the Digital Natives and the Net Generation. The longer the likes of Paul McGuinness wait to accept the basic fact of control-loss, the less likely they are to survive this shift to a new ecosystem or maybe even prosper in a Music 2.0 world – and the less likely the artists and writers are to get paid anytime soon. So why would the flat rate for digital music solve the rampant music sharing ‘problem’? First, let’s concede that the Net Generation’s reality is such that it has never been easier to share songs and get free music anywhere anytime; not just via P2P filesharing (in fact, P2P really is the smallest piece of this puzzle – and so we should stop obsessing on it) but also via Bluetooth, USB-stick swapping, hard-drive trading, instant messaging, Skype, Gmail, social networks, MP3 blogs, stream-ripping, and hundreds of music-sharing widgets that offer the world’s entire music catalog on demand, now, for free. And recently, driven by the explosion in powerful mobile devices aka cell phones and wireless broadband access (streaming) is now starting to replace ownership (downloading), as well, with a vast cornucopia of music-sharing tools recently arising, making the ‘old’ Napster-style P2P music sharing look like amateur day. From Songza to Project Playlist to Seeqpod and Qloud – the web really IS the new radio, now. So, despite all those costly efforts by the RIAA, IFPI & BPI to curtain or shall we say kill these trends, music sharing is alive, well, and… yes, positively exploding. And music sharing is what will drive the next boom of this industry: just wait until we have 100 million iPhones and 300 million WiFi-enabled iPods, with Apple’s new iPhone SDK luring thousands of enterprising young developers into creating the coolest new music-sharing applications. Add another 2.5 billion second-generation, interconnected Nokia, Samsung, LG, and Motorola mobile communication computers, and – voila – you have your mobile sharing nirvana. Still dreaming of controlling distribution? Still not interested – or willing – in putting a flat-rate connected metering device into the networks and build automatic ‘feels like free to the users’ payment right into this scenario? If so, how do you plan to realize your protection schemes in these new worlds? Now, let’s keep in mind that history has already shown a workable way out of this dilemma, in the shape of the blanket licenses that Performing Rights Organizations (PROs) such as SACEM or BMI and ASCAP have been providing for over 100 years now (France’s SACEM launched in 1851!). Back then, rather than asking each and every user (or each service provider, i.e. the radio stations) to get individual permissions for each individual musical work, the industry — helped by some not-so-gentle government pressure — instituted a negotiated, default, and standardized license that is available to everyone who cares to be licensed. An open standard that can be depended upon; a blanket permission. Simple, right? Sure, these existing blanket licenses, and indeed a good many of the national societies that administer them, could and will have to certainly be improved upon, but in principle, the public performance blanket licenses granted by these copyright collectives are generally easy to obtain as well as (for the most part) economically realistic, and they could cover just about every usage scenario – at least, they used to, until the advent of the Internet. Ooopps. This sometimes clumsy but legally straightforward system is traditionally administered via those national performing rights organizations and has allowed the ‘users’ to enjoy the benefits of unrestricted public music usage in clubs, restaurants, concert venues, and on the radio and TV for quite some time now. Collective blanket licenses, although often plenty contested and constantly renegotiated by the involved parties, still provide all-inclusive access for the users and to a very large degree solve the problem at hand: enabling every user — and the companies that serve them — to be legal while filling up a nice pool of money on a recurring basis. A win-win-win, really, until now. Yes indeed, for the past 10 years, the music rights-holders and those very same organizations that represent them have repeatedly failed to provide licenses for those music usages that are now a standard for almost of the online population: using the Net to get access to music; i.e. using the Net as Radio! It is obvious to anyone that cares to listen to what those digital natives are saying: what we really DO NOT need is another super-policed and ueber-controlled version of the Internet that Paul McGuinness (Achtung!) and the IFPI seem to long for. What we need is simply a new blanket license for the use of music on digital networks, voluntarily agreed upon and provided by ALL creators and their representatives – a pool of money and a fair way to split it up (as my old friend and fellow digital music evangelist Jim Griffin likes to say). Personally, I believe that this new license is very likely to be the music industry’s only realistic and timely chance to create a new basis for (re)monetizing music in the age of uncontrollable distribution. And let’s be clear about one thing: The flat rate is just the beginning of a new music ecosystem in which many new revenue streams will become available. The income from this new blanket license will just be one fruit on this new tree that is growing in the gardens of this new music ecosystem. The envisioned digital music flat fee would very likely be bundled into other services (think ISPs, wireless, search etc) and would ensure that a user’s basic connection is guaranteed and legalized. But in my often quoted music-like-water analogy this is indeed a fundamental distinction that we need to note: water is obviously not freely reproduced; unlike copies of digital music files, a gallon of water used in one location can no longer be used somewhere else. The reproduction cost of digital music is, however, essentially zero, and we must therefore not provide just flat-rate access but also at least some very attractive flat-rate consumption provisions, as well, unlike water where the access is flat-rated but the use is not. Bits and bytes essentially require licensed ubiquity. As with most flat rates, the ‘payments’ for digital music will be woven into other service offerings and therefore become less noticeable, burdensome or obtrusive, thereby becoming an accepted mode of getting what you want without having to make a constant music purchasing decision every single time. In fact, most of the users would probably be okay with opting into advertising supported programs that would allow them to ‘pay with attention’ rather than with cash (similar to what Google is now doing in China!). At the anticipated 1 Euro per week per user this concept does not seem far-fetched – after all, the direct, personalized access to individual, tightly targeted and engaged consumers is what every Chief Marketing Officer of every large brand and every clued-in media buyer would love to have at their fingertips. In order for this to work for every single potential user, no excessive granularity could be employed (e.g. counting how many hours of music you actually listen to), few restrictions on usage could be imposed and no substantial harm would be done if some really determined users would be able circumvent the system (similar to freeloading on cable TV). In this quickly dawning Future of Music we urgently need to get our heads around the fact that the less control we impose on the users of music the better. It is the SHARING that drives up the use, which drives up the remuneration opportunities. In music, our goal will always have be to attract and retain large and engaged audiences — to enthrall the highest possible number of interested people, and by extension to have everyone share their music discoveries with others, thereby driving exposure through the roof; and then sell lots of other music products and services on top if the flat-rated access. The more we try to control, limit, or otherwise inhibit the sharing process, the less attention we will get to take advantage of: Attention is indeed the new distribution. And yes, very real money will be paid for real attention, and not only can we get a nice chunk of all that new cash but we can also collect marketing information for selling more music products to everyone. So, the key question is (and have a lot more thoughts on that here): How will content creators actually monetize this attention and turn it into real dollars, euros, kroners, rupees, or yen? First, we must start by giving everyone “feels like free” access to music, NOW. Blanket licensed access that in and by itself already generates real money, be it through cash subscriptions, ad-support, bundling, sponsorship, product tie-ins, or by simply generating traffic in the context of another service or product (see Gmail or Google Adwords). Look at Radio which now generates billions of dollars in ad revenues based on music licensed via the now-compulsory music license. In fact, radio churns out more cash than the recorded music industry itself! The correspondingly flat-rate-licensed use of music on digital networks, be it for streaming or for downloading, would also quickly generate billions of dollars of revenue that could have already been distributed to the creators, as well. And it would only be the start. Creators are now exceedingly ill served by the outrageous ignorance with which their own representatives keep refusing such licenses; denying the use of music more often than allowing it. What a paradox! The music industry must urgently move toward blessing the ubiquitous use of music on a blanket basis rather than asking for individual admission deals. Read my twitter: Flat-rate or flat-line — those are the options. The Wall Street Journal calls Gerd one of the leading media futurists in the world. His keynotes, talks, videos and think-tank appearances are renowned for his hard-hitting, provocative yet inspiring and motivational style. With over 100 engagements in 23 countries during the past 3 years Gerd has addressed top level audiences in the sectors of recorded music & music publishing, radio, TV, film/video and broadcasting, online gaming and virtual worlds, telecom & wireless, and advertising and branding. Gerd is a fellow of the Royal Society for the Arts (London), and resides in Basel, Switzerland. I am not sure if I understand you correctly even after taking some time reading other blog posts of yours. At least I could understand McGuinness’s speech. – I think McGuinness was trying to share his frustration with the status quo and suggested general direction (of sharing revenue with tech companies that are profiting from free music), not anything like a police state. – In a way, your suggestion seems similar to his in that we need to monitor the music ‘usage’. I don’t understand what material difference there is. I would think he may even buy your suggested model, as long as it can feed musicians (and their supporters like himself). Why are you so mad at him? – You seem to propose a flat(=fixed and same for everyone for universal access to any music. Correct me if I am wrong.) fee license for streaming and something similar for downloads. On a high level, I agree with you. My own suggestion, which I am about to post on my blog, is directionally similar. One thing I feel uncomfortable about this whole ‘what should be the future of music’ discussion is that it tends to be “either A or B”: Free vs. non-free, access vs. downloads, etc. How come the advent of Internet, a great innovatino of our age, reduce our choices? There must be ways to make all these possible. I think the problem is that we lost some choices. How reasonable a new model is, I would like to have it as a choice not requirement.